A thermos is a drink container that uses several layers of insulation to trap heat, keeping hot liquids hot and cold liquids cold for long periods of time. 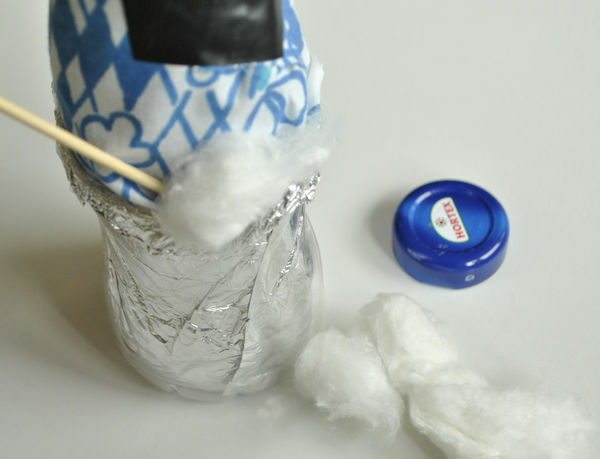 You can make your own thermos for a science fair project or for everyday use as long as you have a few basic materials and a bit of extra time. Use any plastic or glass bottle with a reusable cap. The bottle should be the right size to hold an individual drink. Under most conditions, glass is a better insulator than plastic. Plastic is cheaper and easier to work with, however, and it does have decent enough properties as an insulator to work for this project. Additionally, it is important that you use a bottle with a reusable cap, and many glass bottles do not have reusable caps. Spread out a long sheet of paper towels on your working surface. Center the bottle on one end of this sheet and gradually roll it over the paper towels, wrapping the paper towels around it in the process. Your long sheet of paper towel should consist of several individual sheets still bound together. Use enough material to cover your bottle at least three times. To make the rolling processing easier, tape the near edge of your paper towel sheet to the bottle before you begin rolling the bottle up. 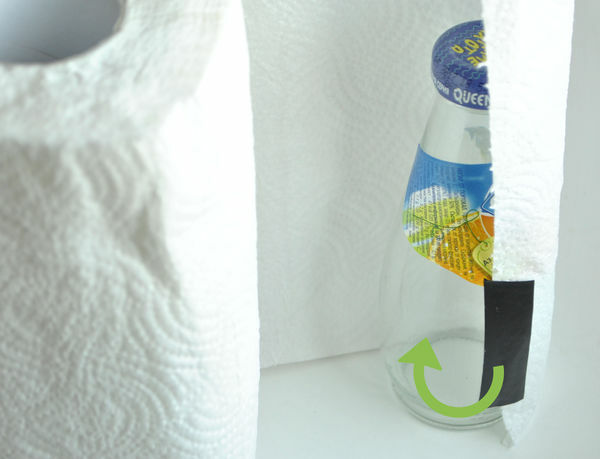 Try to keep the bottle straight as you roll it so that the paper towel wraps around the bottle in even layers. When finished, stick a large piece of electrical tape over the open end of the paper towel to hold it down and in place. For extra insulation, adhere disposable sanitary towels around the bottle, using electrical tape to seal the gaps between the towels. Spread out a long sheet of aluminum foil on your working surface. 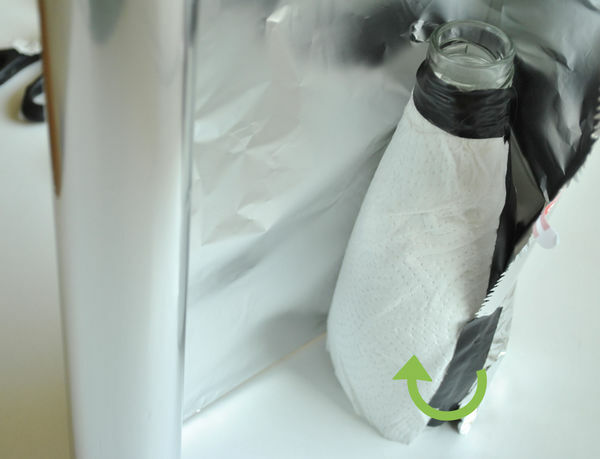 As you did with the paper towels, center the bottle on one end of the foil sheet and roll it over the sheet, wrapping the foil around it as you work. 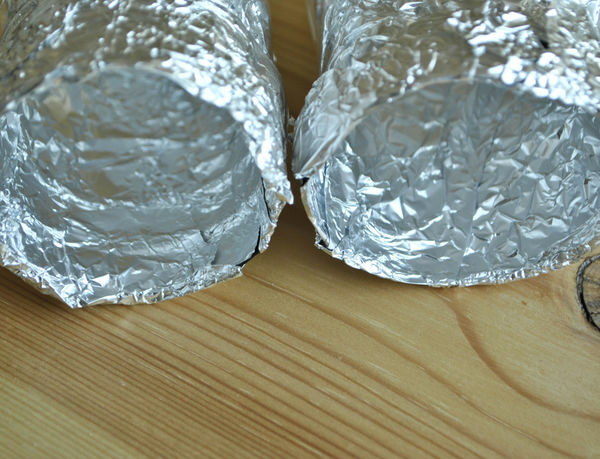 Your aluminum foil sheet should be at least as long as the paper towel sheet you used, if not a bit longer. 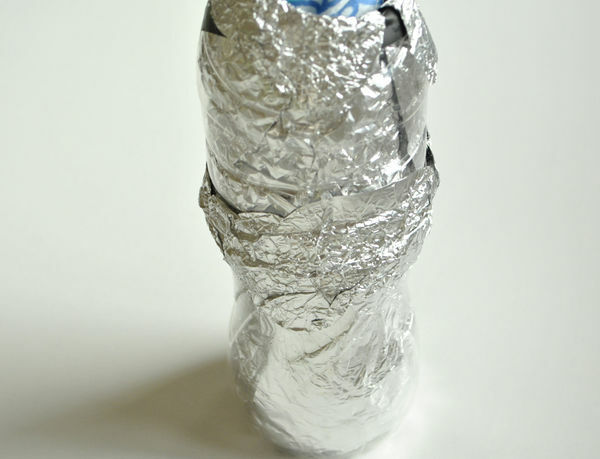 As you begin, tape the near edge of the aluminum foil to the paper towels on your bottle to hold it in place. Doing so will make it easier for you to roll the foil over the bottle. Continually flatten the foil over the surface of the bottle as you roll. Also, make sure that you roll the bottle in a straight path so that the layers are even. If the foil rips during the wrapping process, apply tape to the rip and continue rolling. Tape the open end of the foil when you finish wrapping the bottle up. 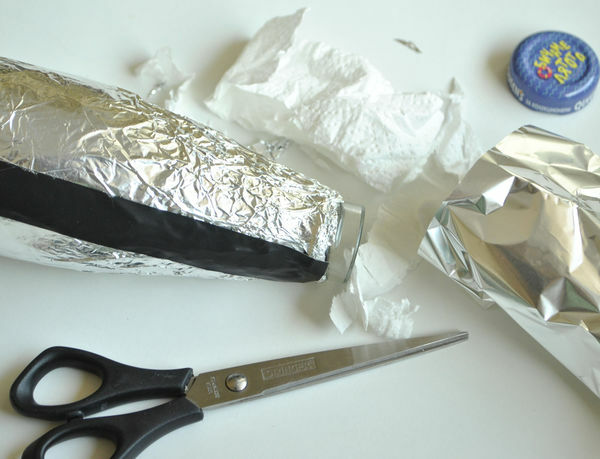 Use scissors to trim off any excess paper towel or foil sticking out beyond the top and bottom of the bottle. Make sure that enough of the material has been removed from the mouth of the bottle for you to sip from it. As you trim away any excess, keep in mind that the paper towel layer should never be visible from beneath the foil layer. Stick electrical tape to the top of your bottle, starting at or just above the foil layer. Wrap the tape around the bottle in a downward spiral, bringing it all the way around the sides of the bottle and down to the very bottom. Even though the foil may remain on the bottle without the use of tape, using tape provides an added level of security. Black electrical tape, in particular, is the best choice because it also adds another layer of insulation to your makeshift thermos. The construction phase of your thermos is finished. To verify that it works, you should pour hot water into the thermos. Take the temperature of the water immediately after you pour it into the water, then check the temperature in 30-minute intervals after that. If you are satisfied with the effectiveness of your thermos, you can use it as it currently is. If are still unsatisfied, however, try adding more layers of insulation or try a different method of construction. One bottle should be able to fit into the other with no difficulty. 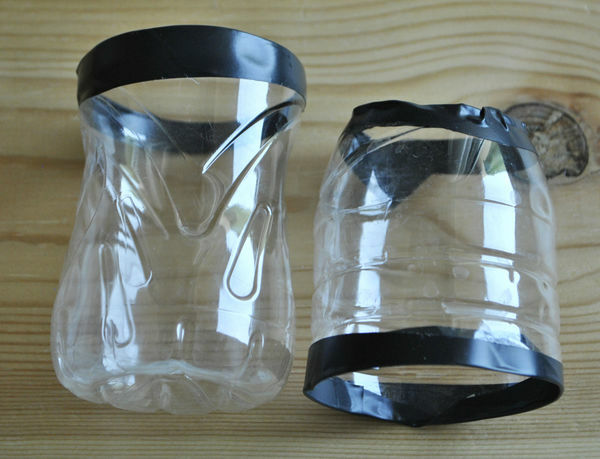 The inner bottle can be made of glass or plastic, but the outer bottle should be made of plastic. Make sure that the inner bottle also has a reusable cap. 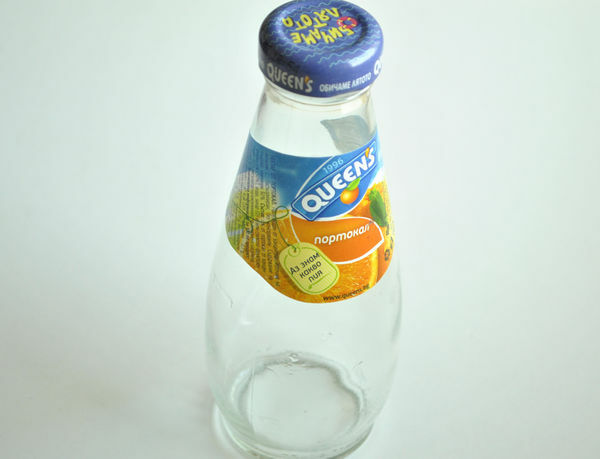 The outer (larger) bottle needs to be cut apart, so that is why you should use a plastic bottle instead of a glass one. 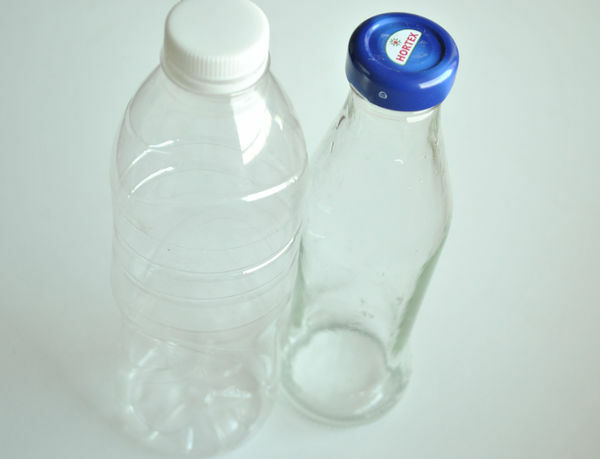 Glass is a better insulator than plastic under most conditions, so if you can find a glass bottle with a reusable cap, use that for the smaller inner bottle. The cap is important, though, so use a plastic bottle with a reusable cap if you cannot find a glass one that will work. A 1-qt (1-L) bottle and 2-qt (2-L) bottle will usually work for this project. If you are not satisfied with the size of these bottles, however, you can use two different sizes as long as the smaller bottle can fit inside the larger bottle with a little spare room along the sides. 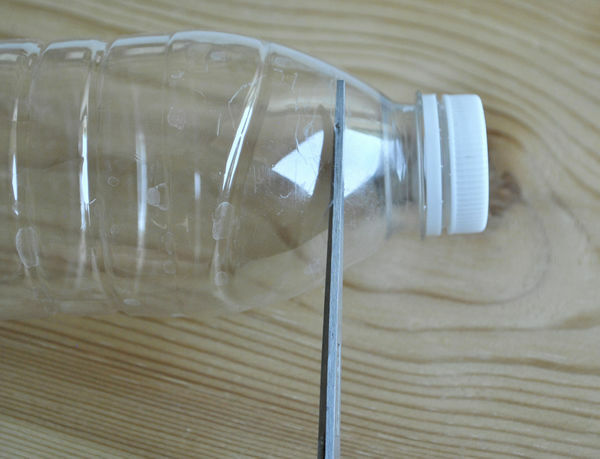 Use sharp scissors to carefully remove the very top of the larger bottle, cutting just below the neck. You need to leave the curved portion of the top intact. Note that this part of the bottle is usually one of the thickest portions, so you should exercise as much caution as possible when cutting through it. The hole needs to be just large enough for the neck of the inner (smaller) bottle to poke through it. Consider covering the sharp cut edge with a layer of thick electrical tape to prevent yourself from accidentally getting cut as you work. Lay the larger bottle on its side and carefully cut it in half, leaving the bottom half just a little larger than the top half. Cut crosswise across the bottle, not lengthwise. Cut evenly around the bottle. Your cut should be parallel to your working surface the entire way around. Consider covering the sharp cut edges of the top and bottom with additional electrical tape to prevent accidental cuts and scrapes. 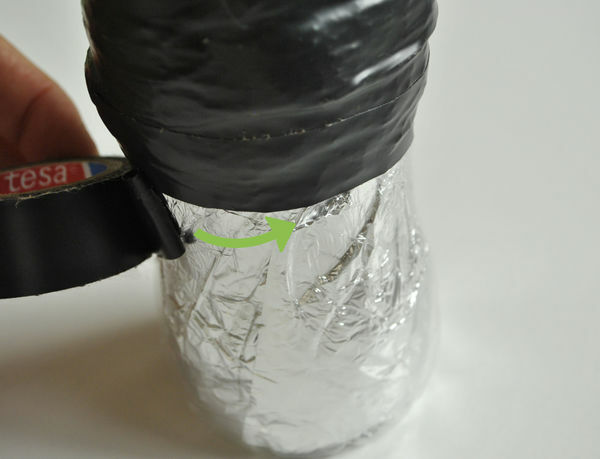 Wrap aluminum foil along the inside of both bottle halves. Extend the foil so that it folds over the sharp, cut edges of the bottle, as well. 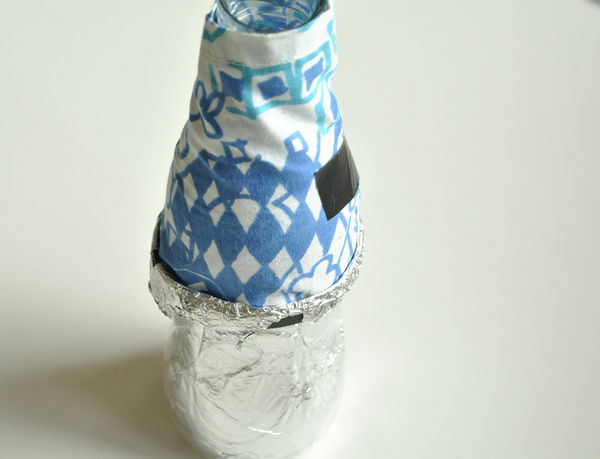 Metal is an insulator, so covering the inside of the outer bottle with aluminum foil adds a layer of insulation. 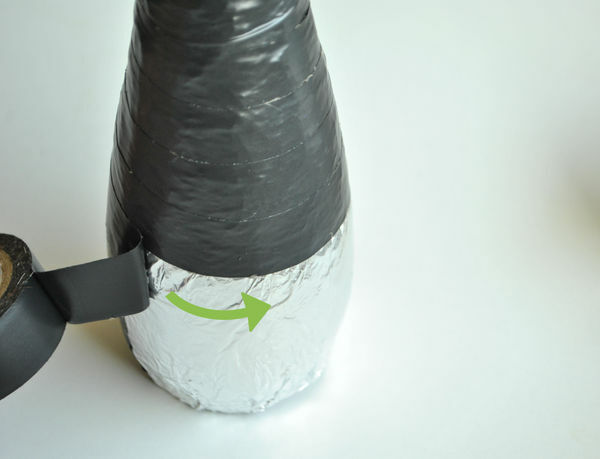 You only need a single layer of foil, though, since you will be using other insulating materials to help retain the heat throughout the contraption. 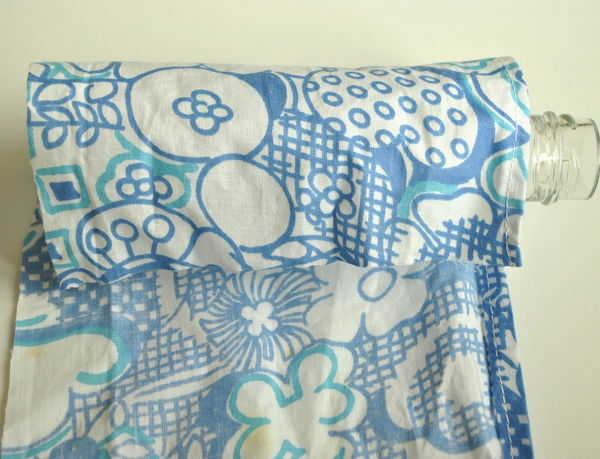 Lay a clean cotton rag on your working surface and lay the smaller bottle on its side along one edge of the cloth. Slowly roll the bottle over the cloth, wrapping the cloth around the bottle in the process. Note that other insulating materials could be used instead of the cloth if desired. You could use pink fiberglass, for instance. If you do use cloth, stick with cotton or another material that traps heat well. Avoid light, airy fabrics like chiffon, which may not provide adequate insulation. You will likely need to tape the cloth in place to prevent it from slipping. Rest the bottom of the smaller bottle inside the bottom of the top bottle, centering the two together. 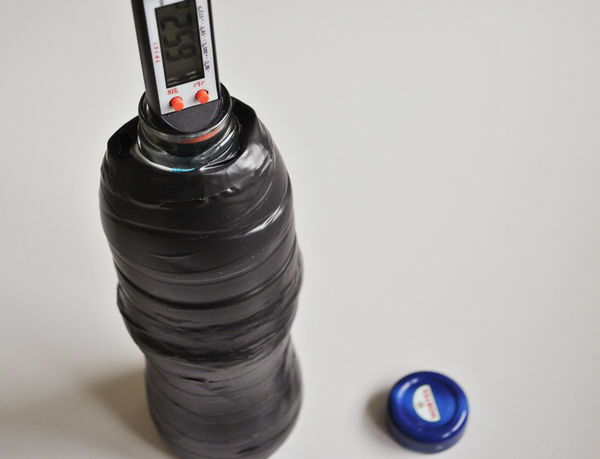 Use hot glue from a hot glue gun to hold the two bottles together. Let the glue dry before continuing to the next step. Stuff cotton balls into any remaining gap between the two bottles. Fill the gap as high as possible, packing the cotton in snugly. If the bottom half of your outer bottle does not completely cover the height of your inner bottle, you may need to stuff some cotton into the top half, as well. Do so as you begin piecing the halves together in the next step. You could try other insulating materials instead of the cotton if desired. For instance, foam beanbag beads, styrofoam packing peanuts, or polyfill insulation could all work well. Fit the top half over the bottom half so that the two overlap. Insert the neck of the smaller bottle through the hole in your top outer half as you slide the top piece on. If you need to add cotton to the top half of your contraption, use tweezers or a chopstick to wedge pieces of cotton into the top half, working from its larger opening, once the two halves are partially connected yet not all the way pushed together. Since both openings are the same size, you may need to press the plastic in on the bottom half as you slide the top half over it. Be patient since this step will likely take some time and effort to complete. 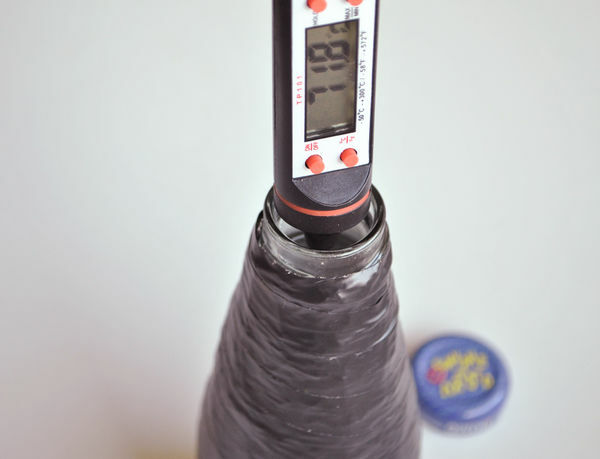 If necessary, make a 1/2 inch (1.25 cm) slit into the top half and bottom half of the outer bottle. Doing so loosens the plastic a bit, which may make it easier for you to get the bottle halves together initially. Tape the bottom edge of your top outer half onto the bottom outer half. Wrap the rest of the outside in electrical tape, as well, covering all sides. The electrical tape has three purposes: As tape, it helps hold the structure together, preventing the halves from slipping apart with use. As electrical tape, it has insulating properties, thereby making your thermos even more useful. As an outer coating, it hides the “guts” of your thermos from sight, making the contraption look a little neater. The construction phase is complete. To check on how long the thermos will retain heat, pour hot water into it and check the temperature. Check the temperature again in 15 to 30 minute intervals. If you are satisfied with the amount of heat your thermos retains and the amount of time it holds it, the thermos is ready to use. If not, try making another thermos using different insulating materials instead of cloth and cotton balls.